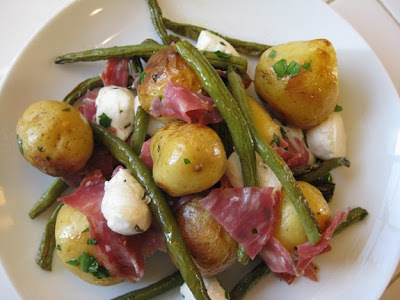 Trixie Belle Cooks Roasted Green Bean and Potato Salad with Soppressata and Mozzarella. Mmm... Soppressata, mozzarella and potatoes. You have all your food groups together in one bowl. Melissa Z send me an e-mail for her potato recipe without any links... bad girl. I'm pretty sure I know which Melissa it is but I could be wrong. So for now I'm going to call her... Call Girl Z. *update... Melissa Z is A Gold Diggin' Ho! Peel sweet potatoes, if using white potatoes peel, if using red leave the skin on. Cut up into chunks. I cut the sweet potatoes larger cause they cook faster. Place in 9x13 pan and drizzle olive oil across the top. Mix, I use my hands, and make sure all of the spuds have olive oil on them. You might need to add more. Bake at 400 degrees for an hour. I always check at 45 minutes. Sometimes it takes longer. These are so good. You can also cook them in a large fry pan on the stove top. PS I have a gas oven so sometimes my cooking times are off. I'm pretty sure I have included everyone. If I haven't, be kind. I will fix any mistakes I have made. I forgot how hard and exhausting it is to watch a 18 month old kid. I'm sure my mind purposely forgot because after having 3 in a row because if I didn't forget I would have killed myself a long time ago. Anybody who is taking care of a wee little one... wow... all I can say is wow. I wanted to say thank you for doing this with Cathy and I. Eventually I hope to get to all of your blogs and actually comment on them. This whole month has been a little screwy and hopefully things will go back to normal or what I consider normal. All righty then... the torch is now passed to my favorite wheezy one and her little chihuahuas. Another month of potato cookin' bliss! And you are welcome to move next door [you can kick my in-laws out!] and steal some flowers, so long as you take a few weeds along with them. A great line up Krysta and thanks for performing hostess duties for us. There was a point or two or maybe SEVEN where I was actually tempted to lick my monitor. I aspire to one day becoming a potato hoe! This is what I love about this event, like with Presto Pasta Nights. When you think people can't do anything different with potatoes, it's like "think again!" I love so many of these and I'm excited at the prospect of making totally new potato stuff for Steve (I'll eat some of it too hehehe). Drool all over my desk, again! HOW am I going to get it out of the spaces in my keyboard??? OMG, I am sooo hungry now. I am also a potato hoe, I love them in any way I can get them. Every last one of these pictures just made me want them more and more. omg, everything looks so good! i'm bummed that i missed this. i will try to get it together for next month! man, o, man: what a great collection. and no one made my seeecret recipe for next month, either! yesss!